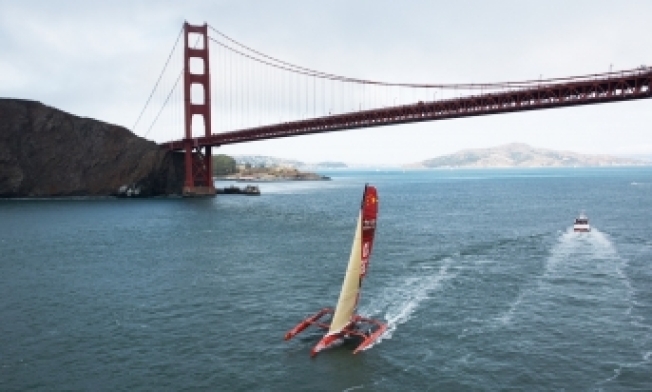 The U.S. Coast Guard suspended a search on Thursday morning for a missing 50-year-old Chinese sailor who departed San Francisco last week in an attempt to set a non-stop solo trans-Pacific sailing record. But Guo Chuan has still not been found. "Mr. Chuan was a professional mariner with a deep passion for sailing," Honolulu-based US Coast Guard Capt. Robert Hendrickson said in a statement. "Our thanks to our Navy partners who helped us search for this vessel in a timely manner so far from shore in an attempt to locate Mr. Chuan. Our deepest condolences go out not only to his family and friends but also to his racing team and the sailing community." Chuan was reported overdue while sailing his 97-foot super trimaran from San Francisco to Shanghai on Tuesday, officials said. His boat, the Qingdao China, had been located with no one on board. An airborne crew from the Coast Guard Air Station Barbers Point was launched, along with vessels in the area, to search for Chuan. On Tuesday morning, watchstanders at the Coast Guard Joint Rescue Coordination Center in Honolulu received word from Chinese maritime officials that the vessel, with one person aboard, had not been heard from for 24 hours. The Qingdao China was actively transmitting on an automatic identification system that showed the vessel's position at the time 620 miles northwest of Oahu. Chuan is regarded as a very experienced sailor and was reportedly in good health before he departed San Francisco on Oct. 18. It was only recently that he hadn't been communicating with his family and martime officials.